One of the many - and I mean many - jokes that were made the day President Obama was awarded his Nobel Peace Prize was the fact it was so ironic he should be awarded a peace prize on the day he chose to bomb the moon. Kidding aside, Obama - or in his name NASA - shot a rocket into the moon's south pole in search of ice. 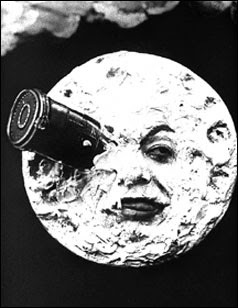 Now quite apart from conjuring up images of French visionary film maker Georges Melies, and his milestone silent sci-fi film, 1902’s Le voyage dans la lune (A Trip To The Moon), the bombing of the moon underlines a very unfunny reality: Earth is running out of potable water. Why else are we looking for a source of water on, of all places, the moon? 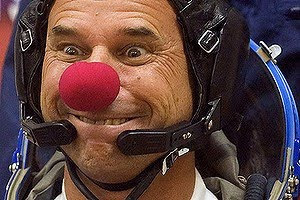 And it wasn't coincidence last week that at the same time the U.S. was bombing the moon, some clown was visiting the International Space Station. Guy Laliberté, the founder of the internationally acclaimed Cirque de Soliel, spent millions to tag along with a couple of Soviet rocket jockeys as Canada's first space tourist and millions more to produce an international 14 city televised extravaganza featuring U2 focused on the desperate shape earth is in when it comes to water. Say what you will about Lalibterté, and there are those who have said quite a bit, more power to the hedonistic multi-millionaire for putting his own money where his mouth is and bringing this deplorable situation to our attention. Many questioned awarding Obama a Nobel prize last week. Moreover, many now criticize the Nobel Committee for moving so far away from the criteria for the award established by Alfred Nobel. According to Nobel's will, the Peace Prize should be awarded to the person who: “during the preceding year...shall have done the most or the best work for fraternity between nations, for the abolition or reduction of standing armies and for the holding and promotion of peace congresses". In recent years, the committee more than recognizing past deeds has awarded the peace prize so that attention will be drawn to issues. Two years ago, former Vice President Al Gore along with the UN Intergovernmental Panel on Climate Change was awarded the Peace Prize "for their efforts to build up and disseminate greater knowledge about man-made climate change, and to lay the foundations for the measures that are needed to counteract such change". The more cynical will say Gore was awarded his peace prize for writing and starring in a movie. The not so cynical will say his Nobel was richly deserved. Personally, I think that argument is irrelevant. The real argument is are the efforts of people like Gore and Guy Laliberté having any impact? A recent international public opinion poll asked people on a scale of 1-10, "how high a priority should your government place on addressing climate change?" Americans don't seem to attach much importance to it, coming in at 4.7 out of 10. While I didn't go for the laugh today, I like to think of this as a humour blog. Today, however, that poll result is the joke. 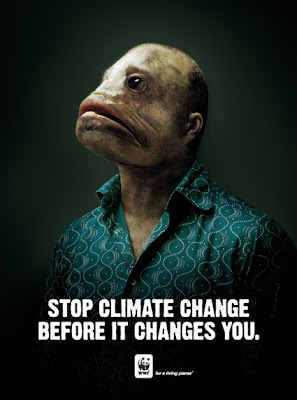 For more views on climate change be sure and visit my blogger buddies at Theme Thursday. 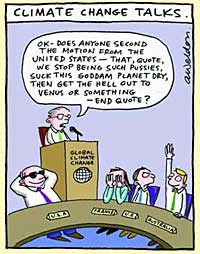 And take a boo at Blog Action Day where over 8,000 bloggers in 148 countries are writing about climate change today. hey i know the guy in the last pic. lol. seriously though, its not too late. Tellin' it like it is... and given us a chuckle at the same time... well done, Dufus! If nothing's done then it really may be time to panic. Nicely done! That last pic is a little scary! Cat Lady: The older I get the more serious I realize the problem is. There's a story running today in Canada about the melting Arctic. This is truly scarey stuff. No joke. Betsy: Juxtaposing the pic with my post you might refer to it as a fish out of water! I think I dated that chick in the last pic. Good post. Scary how many people are blowing this off. I'm not sure that Obama deserves the peace prize. Only time will tell. Great job Noname! Such a thoughtful and insightful post. And you still managed to give it a twist of humor. I was up at 4 am to watch the bombing of the moon through a high-powered telescope - 74 million dollars later and what did we get? Nothing, a big fat nothing! Thank you for raising awareness today. PS - Because of the last pic I now have rolly, polly fish heads playing in my head. thinkinfyou: We need to think about it more! Don: Cynic! I suppose you'd prefer spare change? moooooog: The Beach Boys actually sang about her in California Gills. Dreamhaven: Maybe they gave it to him just for the halibut! Quirks: Thank you ma'am. It's a difficult subject to poke fun at. Me-Me: I guess you could say that moon bombing thingy was a tad anti-climatic! Interesting web of connectios here! Yes, i took the TT for ahumour opp myself. Colette: No problem. Thanks for visiting. ...mmm...: I'll have to stop by and take a look. Thanks for dropping in. Nice try, NoName, and you made me laugh a little, but I'm afraid it's too late. We're fucked. There are a lot more people in the world like Don than you, and even the folks who believe the planet's in trouble aren't willing to make the radical lifestyle changes required to slow global warming. Only one thing will do it: Profit. If somebody can figure out a way to make money saving the planet, then we'll be OK. Assuming we haven't set an irreversible series of events in motion, of course. Hey, you know what the next captcha word was? Good post, Noname! That last picture makes me wonder - we had so much rain this past July, and when it wasn't raining the air was still in the 90 - 100% range, that I wondered if we weren't gonna have to develop gills to breathe. My own post is fairly sober, but that's because I drained my humor gland dry on the Willow Manor Ball post! MikeWJ: Well, I'll be dead before the apocalypse but my kids and grandkids may still be kicking. It's quite sad where we're headed. HH: shhhh! I'm a little left of centre. But then I'm Canadian, eh? Roy: the screwy weather's the fault of climate change. Every year it gets a little more bizarre, don't ya think? hopefully we'll try to keep the world livable--maybe climate change is a way for the earth to shake us pesky little fleas off its back. Tom: haha, now there's an image. Interesting. Hopefully we can find out how to deal with the water here before having no choice but to look off-planet! Wings: NASA must think it's good to have a back up plan. e: Wasn't that fascinating. There were no figures for my fellow Canadians, but I'm sure, sadly, that they aren't far behind. Nicely done. I believe I will enjoy following you. (In a less creepy, non-stalker way). Go planet. MJM: I will certainly enjoy being followed! Great post actually. Humour and social commentary. You're right about the arctic took they reckon we'll see land mass inside 10 years and the caribou are diminishing at alarming rates due to climactic change. Very sad. Baino: Yeah it's hard to make light of such a sad, sad concern. Thanks for your interest.